Before I found out that I was pregnant, I was very much enjoying running every other day including distances from 4-8 miles. I ran a bunch of 5k races and broke my previous PRs which was very exciting. I often questioned why I was performing so much better than I was in high school despite not training all that much differently and the answer was clear: proper nutrition. As a nutrition professional, I learned how to fuel my body properly to perform my best. During this year that I was running, I felt amazing and feel that I looked my best. Currently, I am running a bit but have fully gotten back into it since having the baby. Nutrition plays such an important role in running. If you are not eating properly, you are risking performing worse than if you fueled your body properly. You do not have to count calories, protein, carbs or fat in order to do well but should focus on these tips for your best athletic performance. Limiting processed foods is important for anyone, especially an athlete. By eating real foods, you will be able to feel your best. Include lots of whole grains, fruits and vegetables and lean proteins. Eating shortly after a workout helps to speed recovery time and prevent injurt. Aim to eat something within 30-60 minutes of exercising. When we workout, our muscle fibers breakdown, get tired and tear and the way to replenish them is through nutrition. Focus on a balance of protein and carbohydrates for the fastest recovery. The body needs glucose (energy that is to be used) and glycogen (energy that is to be stored) and it is necessary to replenish your stores. Good choices include Greek yogurt with fruit, quinoa and beans, a sweet potato and chicken, a smoothie (key lime protein smoothie) or eggs and toast. Potassium helps with nerve function, muscle control, blood pressure and electrolyte regulation. When an athlete that works out hard, they may lose excessive fluid and therefore not have enough potassium in their bodies which can cause muscle cramping. To prevent this, consume foods rich in potassium within 1-2 hours of exercise. Examples of foods high in potassium include potatoes, bananas, yogurt, tomatoes, citrus fruits, leafy greens, beans and fish (healthy tuna salad). Personally, for a run (that was 4-8 miles, not marathon training), I prefer to eat nothing before I run and hit the pavement first thing when I wakeup. I make sure to refuel right after. If you are going a longer distance or prefer to eat before a run, you can eat a banana with or without peanut butter, toast, sweet potato, healthy banana peanut butter cookies, eggs, etc. Just make sure that you do not eat too much that may give you a cramp. I remember eating a bunch of candy before a run before- not the best decision. Protein can help your body heal faster after a workout and can help to increase muscle mass. For endurance exercises, protein is used for 5-10% of energy and needs to be replaced for tissue repair. Great sources of protein include lean meats, dairy products, beans, nuts, eggs and tofu. 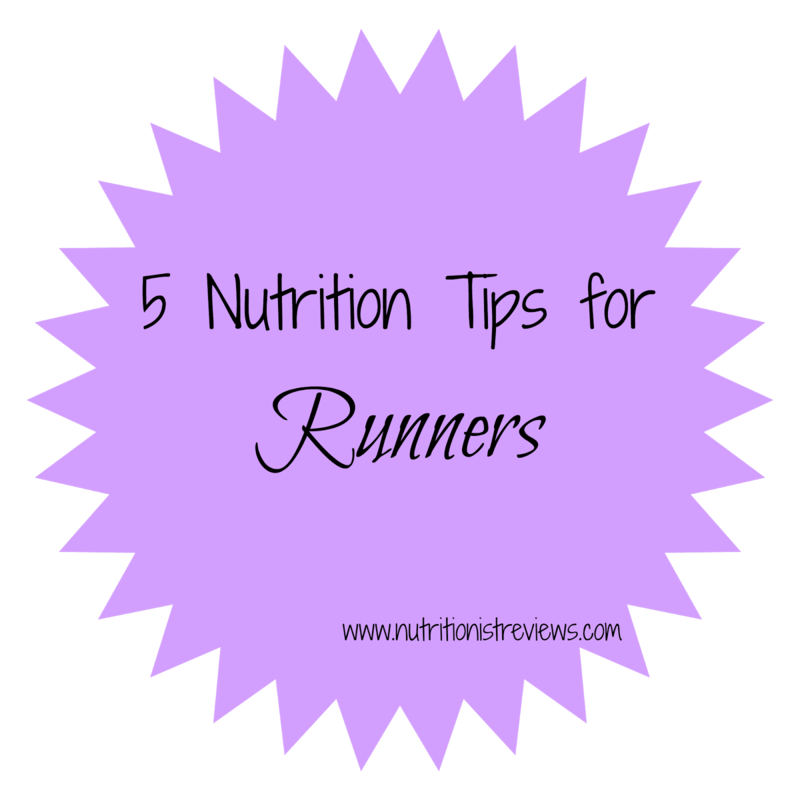 I enjoyed sharing these nutrition tips with you for running! These can be applied to many different types of workouts as well. If you are looking for new running gear including apparel or shoes, check out Zappos.com. They have awesome styles and I love the bright colors of many of their shoes. They have free shipping and a free 365 day return policy as well. Also, there is a Bay to Breakers race in San Diego, CA if you are nearby.